The first is that I seem to consider most plants “grasslike.” Lavenders, yarrows, santolinas, gauras, oreganos, and coleonemas have all had the camera pointed at them in my search for grasslike plants. The English lavenders, in particular, with their masses of flower stalks and unopened flower buds, seem to make me reflexively point my camera like a birddog spotting a grouse. “Grasslike” means sedges, some bulbs, iris-like plants, the more slender phormiums, maybe a few other things, but some part of me seems to want to include everything else that ever grows with an upright form. Fortunately, I’m not in charge of the class. 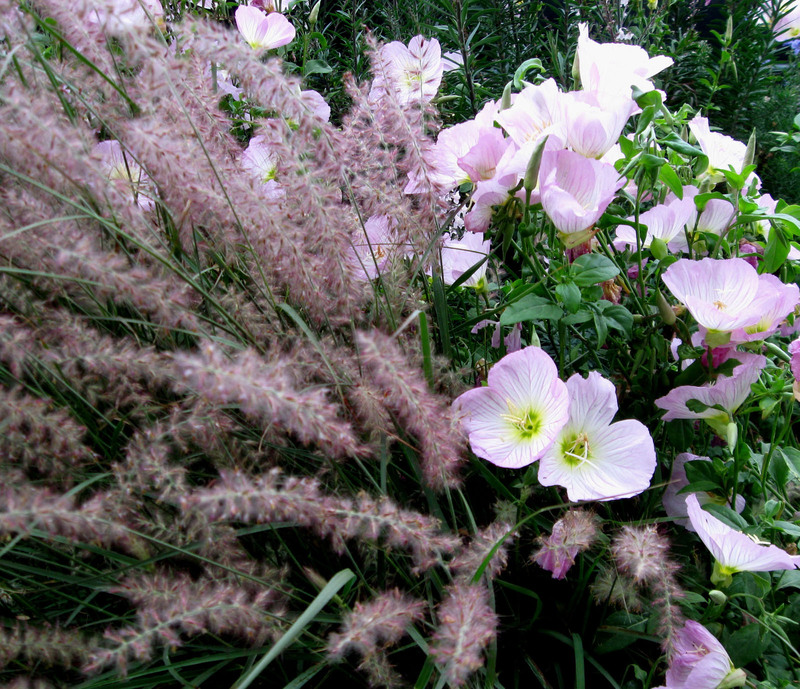 I kept to grasses and grasslike plants in the photos below. Another is that sedges are one of our most reliable problem solvers. Several years ago we did a slew of yards with very heavy clay soil (the “fill a hole with water and wait a week to see if it will drain” kind of heavy), and the sedges are all thriving in them. Carex testacea, carex dipsacea, Berkeley sedge, and to a somewhat lesser degree Carex variegata “Elegantissima” are all looking great, regardless of whether the garden gets regular maintenance or not. 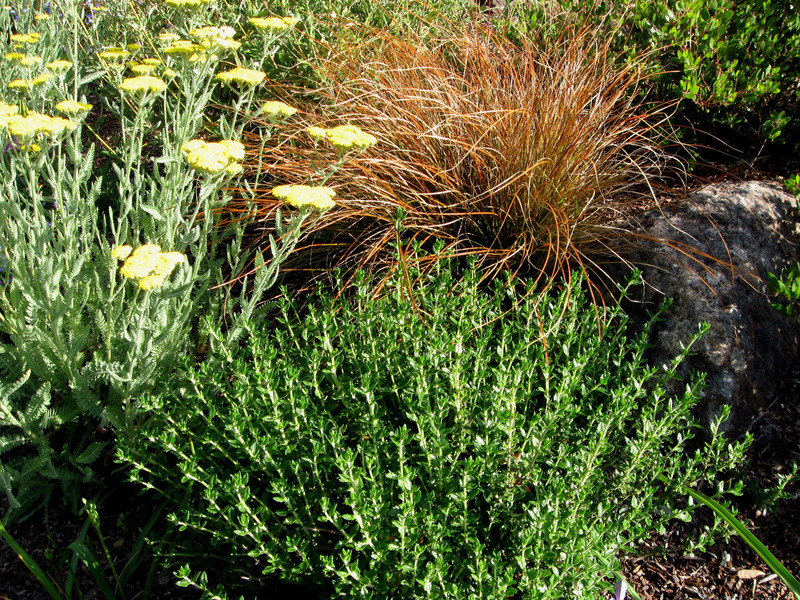 Those plants are also useful for planting next to a lawn, where plants are prone to being overwatered. Do folks know the difference between a sedge and a grass? Well, sedges have edges, rushes are round, grasses are hollow, what have you found. Hiltonpond.org has a detailed explanation of that rhyme and the difference between the three grasslike plants. 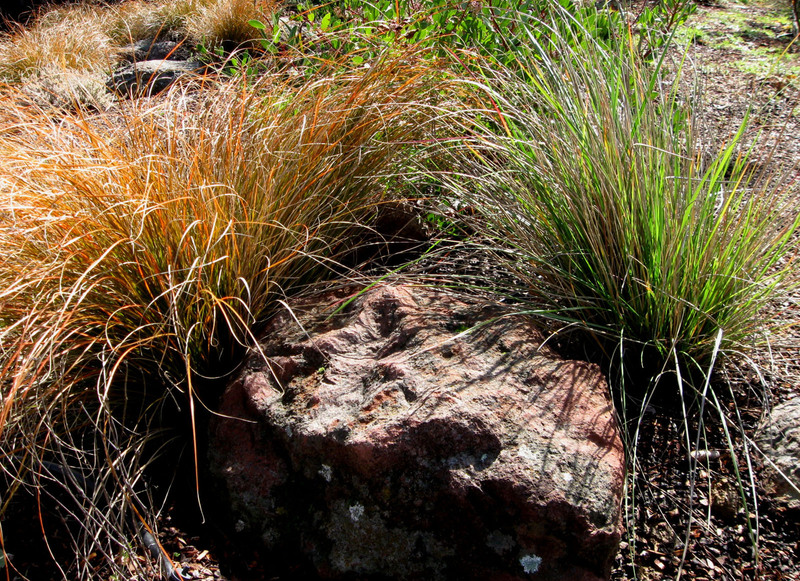 The non-technical, practical difference is that grasses usually need sun and dryness, while sedges can tolerate shade and prefer some moisture. 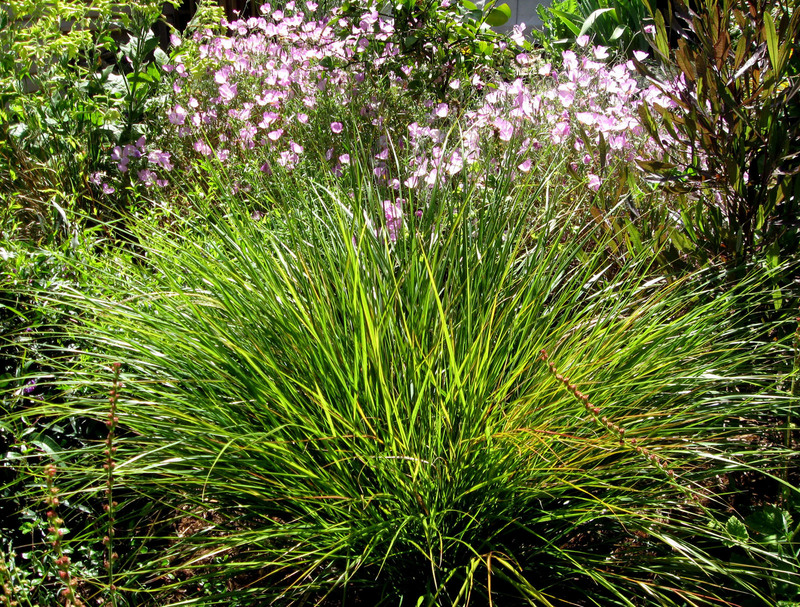 Another significant difference is that grasses usually have much taller, showier, and sometimes “weedier” flower stalks, while sedges usually stay quite tidy with the seed heads held more within the overall foliage instead of above it. California has a ton of nice native grasses. Deer grass is awesome, the Festuca idahoensis cultivars are nicer than boring old blue fescue, the Nassellas are beautiful in the wild or when the light is right or when they are used perfectly in the garden, Festuca californica looks great for at least the first two years before it can get big and rangy, the melicas and deschampsias are pretty when they’re happy, Leymus “Canyon Prince” is great, and there are even more good ones that I’m forgetting. I’m not impressed with a lot of my photographs of them, though. A lot of the more common non-natives seem easier to photograph, though not necessarily nicer in the garden. We need to keep better records of what we’re planting. We plant a lot different grasses and sedges every year and we’ve lost track of what a couple of them were. There are a ton of grasses to keep track of these days, and it’s hard to remember the difference between some of them. Every time we go through a plant availability list, we see new ones that we don’t know. Grasses are especially beautiful during the last couple of hours of daylight every day. I don’t completely approve of planting Mexican Feather Grass (if you plant it in your yard, you are effectively planting it in your neighbor’s yards, too), but it looks amazing at the end of the day. Grasses work great for hellstrips. That opinion is obviously filtered through my pro-grass sensibility and this is the time of year when grasses look their best, but it was overwhelmingly clear how much more successful the hellstrips relying on grasses were, compared to the ones that didn’t use them. It makes sense, people are going to walk through the planting so you need plants that can handle being kicked or stepped on. It’s generally a good idea to plant grasses one size smaller than the bulk of the plants, meaning if you are planting gallon-sized plants you should plant 4″ grasses and if you are planting a lot of 5 gallon plants you should mostly plant gallon grasses. 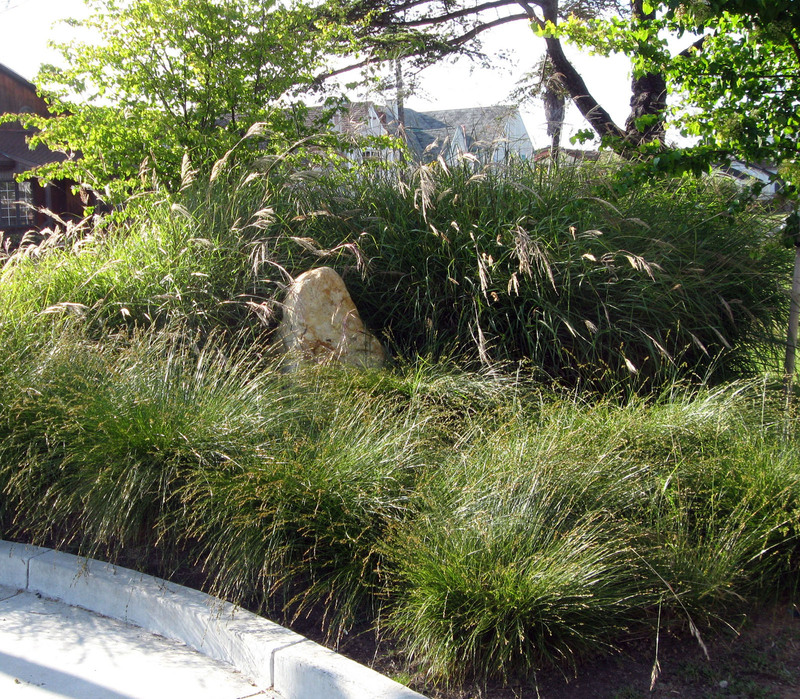 Grasses grow quickly and they can dominate a new planting. Though sometimes that’s what you want. 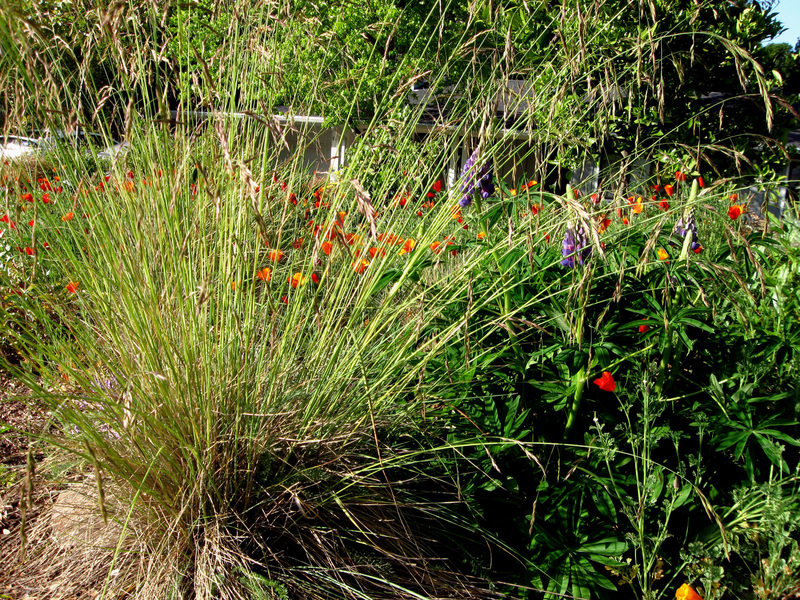 New Zealand Wind Grass (Stipa arundinacea aka Anemanthele lessoniana) never lets us down. It takes a lot of time to go through a lot of photos. Go figure. I have much respect for the photographers who put together the extensive stock photography sites. I’m not sure how many photos I’ll end up posting, but this might be a blog to avoid for a little while if you don’t like ornamental grasses. This entry was posted on Tuesday, June 9th, 2009 at 4:21 am and is filed under plants. You can follow any responses to this entry through the RSS 2.0 feed. You can leave a response, or trackback from your own site. Great post! I love grasses, and really need to learn more. The best thing about them is that they look great when they’re done blooming so you have something interesting to look at for months. Thanks for this extremely educational post. I am trying to learn more about grasses and sedges, and this is a really good introduction to using them in the garden, I appreciate it. I do think it’s funny that things such as grasses can be ‘in style’, but there you are. It’s a nice style. btw, the version of the rhyme I learned was “…and grasses have (something) right down to the ground.” That was from a botanist, who couldn’t remember the operative word, either. Pomona Belvedere if you follow the link Ryan posted for Hilton Pond they have two alternatives to the rhyme. One says “and grasses have nodes all the way to the ground” and the other “and grasses wear robes all the way to the ground”. Very interesting post. 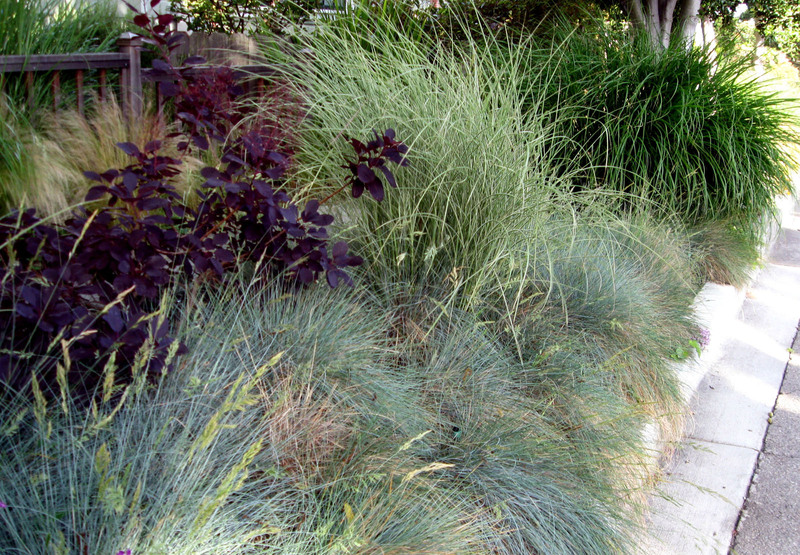 I’m starting to like ornamental grasses and grass-like plants more. It helps to know there are so many options. Great post. I knew there were morphological differences between these plants but hadn’t ever looked into it more. The feather grass is one of those serious love/hate relationships for me. A lot of published projects are using it more and more, which means it’ll be in even more and more home landscapes before long. I almost regret planting 2 plants 10+ years ago because I’d have hundreds if I didn’t keep after the plants in places where I don’t want them. Another grass-like family that I’m getting into is the restios. Some are as drought-tolerant as the dryland grasses (e.g. Thamnochortus insignis). They’re still not that common in the trade. I’ve been growing some short ones from seed to replace my blue fescues, but it’ll be a year before they’re ready–nothing like the more vigorous feather grasses. Hey Ryan, great post! I’ve never heard that rhyme before, but its a great simple way to pick up the differences. I love using grasses in gardens – two of my favourites are Melinis nerviglumis, and Setaria megaphylla – but I doubt that you’re likely to find many pictures of them? This blog needs more garden rhymes. I like the alternative version “grasses have nodes all the way to the ground,” better than the version I knew. I don’t know the restios well at all, though they seem to be becoming more common. I’ve seen some nice ones but I’ve also seen some invasive ones, so I haven’t really experimented. I know they’re not all invasive, so we’ll probably get into them at some point. I’ve never even heard of Melinus or Setaria. I know a few of the ubiquitous South African plants and a few lesser-known favorites, but I don’t know much about the bulk of them. I wish there were more garden bloggers in South Africa writing about them, because a lot of them do well here and I’d like to know more about them. Hellstrip is the name for the strip of dirt between the sidewalk and the street. Also known as a parkway in some of the books, but for me a parkway is a highway, so I’ve been sticking with hellstrip. I thought it was a widely known term, but it’s starting to seem like it’s unique to Anita and I. Great site, maybe you can help me, we are about to plant a grass ground cover for easy maintainence. We live right on the coast in the BOP. What grass would you think suitable? I’m afraid I’m out of my element with New Zealand. (BOP is the Bay of Plenty, right?) I spent six months on the South Island, but never made it to the North. So I don’t know which ones thrive there. I like a lot of the New Zealand carex species, but I don’t know which part they are from. Berkeley sedge, Carex divulsa aka Carex tumicola, is really nice, about a foot tall, green, and sometimes used as a groundcover/rough lawn, but I don’t know how it does up there. Sorry I can’t give any more help than that. Good luck. Great article, amazing looking weblog, added it to my favorites.